By Abi - Egypt - 02 Nov/03 - Viewed 1552 times. It was a grueling seven hour bus ride in one of the worst buses we have yet been on to reach the resort town of Sharm el-Sheikh. Incidentally, they blasted the air conditioner and played movies at a volume level I could not believe at 4:30 in the morning! We arrived and quickly found a cab, although I belatedly realized I had agreed to far too much for the fare. We found a hotel that seemed expensive ($20), but in looking at other possibilities, we realized it was one of the cheapest in town. We slept for several hours, although Travis had sweetly gotten up about 9:00 to check out the different dive places and pick up some snacks for breakfast. We decided on Oonas Dive Shop and were able to start our course the next day. I had been certified about 15 years ago, but needed a refresher course and Travis needed to do all the training, which they said would take about four days. We spent the rest of the day relaxing and dozing. Our instructor was a guy about 40 with long, scraggly hair and many tatoos, mostly of dragons, but also one of a rose with the words "love to mum and dad" on his inner arm. How touching. He seemed nice enough, though, and we were able to get started right away. We watched a couple of videos and were able to get in the water in the afternoon. I did some requirements to prove that I still remembered what to do, while Travis got accustomed to his gear and things like buoyancy. At the end of the first day, we had two chapters to read, as well as questions to answer. The next day was more of the same, basically going from 9:00 to noon with a break for lunch, then again from 1:30 to 5:00. On the third day, we went out on a boat with a larger group for the first open water dive. It was great to be back in the water. The marine life, as well as the coral was just incredible. It truly is another world down there. We were able to dive for about 45 minutes, had lunch and then down again. Travis was really getting the hang of his breathing and regulating it to allow for maximum depth time. We got back to the hotel about 4:30 and enjoyed a night on the town with a delicious dinner at a wonderful Thai restaurant. In the morning, Travis had come down with a cold and was so stuffed up he wasn't able to dive. He stayed in bed while I went out again and it was another great day of diving. There is just so much stuff to look at that you don't even realize that you've been down for as long as you have. It is amazing that it has been this long since I've been diving, but then again Missouri isn't known for its aquatic life! We finished up the course and headed to Dahab, an hour and a half away where we intended to do, what else?....more diving. Dahab has a far more relaxed atmosphere than Sharm. It generally has a younger crowd who is on a tighter budget and things are quite a bit cheaper, too. We arrived in the afternoon and immediately booked a trip for the climb to Mt. 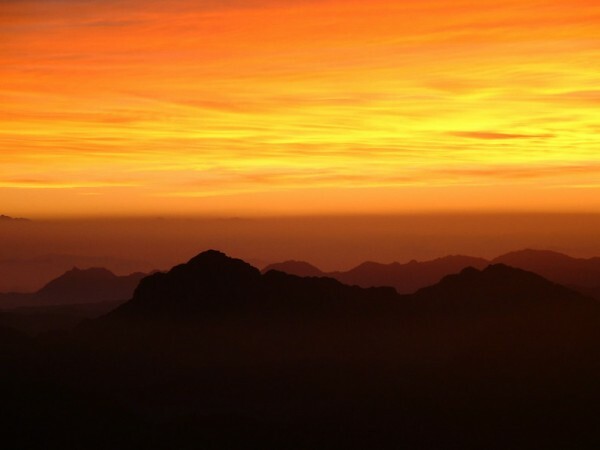 Sinai that evening. The bus left at 11:00 p.m., followed by a 2 hour drive, then a 2 1/2 hour trek up the mountainside. The climb itself was not steep, although it was a little difficult to see in the dark. The path is also used by the camels and several times the camel drivers would ask us to move over. When you looked behind you, all you could see was the monstrous figure of the camel looming over you, which was a little unnerving at first. We reached a spot about 30 minutes before the top and enjoyed some hot chocolate to warm us up for the final ascent. It wasn't freezing, but we definitely needed all of our layers of clothing, plus our jackets. We spent about an hour in the warm cave-like hut chatting with some other travellers until it was time to head on up to see the sunrise. We arrived at the peak about 4:30 and only had to wait about half an hour before the first streaks started to show. It was beautiful, although the rowdy group was a little distracting. Some actually sleep on the top, although I'm not sure how they accomplish this since with about 500 people making the climb, it is bound to be noisy. By 6:00 a.m. the sun was fully up and you could not even glance at it, it was so bright. We descended the 3750 steps down to a monastery, which was built in the 5th Century A.D., apparently next to the bush that God spoke to Moses. It was a beautiful place and quite serene. Once back in the van, we had another two hour ride back to Dahab, where we promptly went back to our room and slept very soundly! In the afternoon, we took a look around the town and found a dive center that had room for us to dive the next day. All of the diving in Dahab is shore diving, that is, you enter from the shore instead of being aboard a boat, which is what you do in Sharm. We took a Land Rover to the spot and suited up. The first dive of the day was intriguing because you drop down into a canyon, which basically looks like a huge mouth waiting to swallow you up. It doesn't appear to be very wide on the surface and you are a little unsure if this is actually what you signed up for. But, it was very exhilarating, going into this cavern. A little further into the dive and you end up in what is called "the fishbowl" an cavelike place where there are a school of translucent fish and you can actually see their skeletons. Incredible. The next day, we had set up a jeep tour of White Canyon, an Oasis and Colored Canyon. White Canyon had many twists and turns and was really cool. The Oasis was an incredible spot as we are walking along in the desert, and suddenly dark green palm trees appear ahead of us. It is almost surreal that you are surrounded by dry, dusty sand and mountains, and then off in the distance there is a lush grouping of trees. You can definitely imagine how important it is to know where the oases are. We continued on to the Colored Canyon, which was amazing. The different minerals in the rocks make weird designs on the walls of the canyon. There were several places we had to climb up, over, around and through and it was really fun. Some of the different colors formed to make tiger eyes, a woman's face and two people kissing. We went back to Sharm that evening and the following day went to Ras Mohammed National Park for three dives there. This is one of the best places in the world for diving, known for its beautiful coral reefs. We also were able to see some manta rays and very large eels. Just seeing all the different colors of fish made me want to have the picture book with me right then to identify all the species I was seeing.